View a pdf of the report here. Submit a comment regarding the Keystone XL pipeline here. A new report out today from environmental groups shows that the Keystone XL tar sands pipeline would, if approved, be responsible for at least 181 million metric tons of carbon dioxide equivalent (CO2e) each year, comparable to the tailpipe emissions from more than 37.7 million cars or 51 coal-fired power plants. In documenting the emissions associated with the controversial pipeline project, the report makes real the scale of climate impact and the further hurdles the project would create for the battle against climate change, putting the State Department’s “business as usual” scenarios into doubt. — The 181 million metric tons of (CO2e) from Keystone XL is equivalent to the tailpipe emissions from more than 37.7 million cars. This is more cars than are currently registered on the entire West Coast (California, Washington, and Oregon), plus Florida, Michigan, and New York – combined. — Between 2015 and 2050, the pipeline alone would result in emissions of 6.34 billion metric tons of CO2e. This amount is greater than the 2011 total annual carbon dioxide emissions of the United States. — The International Energy Agency has said that two-thirds of known fossil fuel reserves must remain undeveloped if we are to avoid a 2 degree C temperature rise. Constructing the Keystone XL pipeline and developing the tar sands make that goal far more difficult, if not impossible, to reach. “When evaluating this project, the State Department should apply a simple test: Does its completion bring the U.S. closer to meeting its climate goals? The answer is clearly no, and therefore the project must be denied,” said Steve Kretzmann, Executive Director of Oil Change International. In its 2012 World Energy Outlook, the IEA is very clear about the impact of climate policy on U.S. oil demand. If meaningful climate policy is pursued, U.S. oil demand would necessarily be cut 50 percent by 2035 and 70 percent by 2050 based on a 2012 baseline. “Alberta’s premier was just in Washington, DC noting how essential the pipeline is to meeting increased production of the dirtiest oil on the planet. The numbers in this report make it clear that we can’t afford to help Big Oil meet that goal,” said Elizabeth Shope of the Natural Resources Defense Council. U.S. demand for oil has declined since 2005 by 2.25 million barrels per day – or the equivalent of almost three Keystone XL pipelines. The report was researched and written by Oil Change International and co-published with input and review by the Natural Resources Defense Council, 350.org, Environment America, National Wildlife Federation, Friends of the Earth, the Sierra Club and Greenpeace. The earth is dying and you let this go on in the name of $$$$$$$$$$$$??? Your children and grandchildren will curse your name as they die in the fumes you are allowing to go on. Take a moment and find some before/after photos of what is going on in Canda. If that doesn’t bother you then there is not help. Interesting that the premier of Alberta is concerned about hitting his economic goal. Why doesn’t Canada build it there? Because the Canadians have been up in arms about it. They don’t want it either. 20 yrs. from now people will spit when they say the name Obama. He’s all talk and no do when it comes to climate change. No worse he’s obviously on the take from the Carbon Barons. 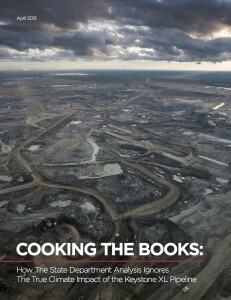 Tar sands is extreme oil in every way. Its extraction is particularly energy and water-intensive, polluting, and destructive. To process it into usable fuel requires complex upgrading and refining that is also highly energy intensive and polluting. Last month, the Exxon’s Pegasus pipeline ruptured and leaked tens of thousands of gallons of heavy crude oil into the environment of Mayflower, Arkansas. This was an extremely serious environmental event. But tar sands oil is even more dangerous to transport because it is more corrosive to pipelines. When something goes wrong, as it inevitably does, it is even more difficult to clean up a tar sands spill. Take a minute to think of the environmental damage from carbon emissions and oil spills that will result if the Keystone pipeline is built. Is it worth so much long term damage to the planet for a few $$$ in the short term? JUST SAY NO to the Keystone pipeline! The push for the Keystone XL isn’t about any benefits for most Americans. It’s about profits for a few. Our history is pretty clear. You only need to consider the repeated episodes of BP’s malfeasance. When profits trump other considerations, maximizing those profits becomes the main objective. The environmental damage becomes irrelevant. Accidents happen again and again. When will the US have a sane energy policy? Buying less gas at the pumps; 5 gallons instead of 10 will reduce green house emmisions. Economic benefits of increased domestic oil consumption are a myth. It only seems to be economical because the out-year costs to the environment (both the destruction of Canadian land and water and the heating of the planet) are not factored into the retail cost of gasoline. If we weren’t cheating the ecology of the earth, we’d never go this route. The time has come to find the courage to do the right thing for the planet. The Keystone Pipeline is just the most immediate crisis that must be opposed. There will be a sequence of actions that must be taken to reduce the negative impact of fossil fuels and develop renewable alternatives. A healthier planet is possible, but only if you and everyone else does their part to create change. You now have a crucial and very public part to play in this process. Let us be a visionary country and explore renewable sustainable sources of energy like solar, wind and geo thermal. Tar Sands Keystone XL is dirty energy and will be a disaster for the world’s wildlife , air, water and land. Kill the Keystone XL pipeline and make room for a cleaner future for our children and grandchildren. We are doomed if we build the pipeline. Think about our planet and human survival. We have got to think clean energy!!! Interesting report. Makes the connection between U.S. oil production and consumption only tenuously, but identifies the need to carry the argument to Congress in an effort to wean the U.S. economy off all carbon-intensive fuels whatever the source or end-use. Achieving an 80% reduction in the use of carbon-intensive fuels by Americans will require a significant change in living standards and a considerable transformation of U.S. industry. Are Americans willing to go there? As for Canadians, the assertion that there is a majority or, at a minimum, a plurality standing in opposition to the exploitation of the Athabasca oil sands deposits is simply wishful thinking. And as to the possibility that the government of Canada will not approve the construction of the Northern Gateway pipeline, chances are less than 50:50 regardless of the purported opposition of the governent of British Columbia to that pipeline or the sentiments of the City of Vancouver’s mayor and council. The State Department’s assessment of the exploitation of the oil sands resource in Canada is likely correct. The resource will be developed and exploited, and exported, if not to the USA, then to China. If it is exported to China, then it is highly unlikely that emissions generated will be curtailed by pollution abatement technology. If processed in the USA, the emissions will fall under the regulatory oversight of the EPA, and the environmental lobby will have some sort of chance of getting the emissions lowered or ideally eliminated by technological means such as carbon capture and storage. In China, there isn’t a snowball’s chance in Hell that any abatement measures will be possible. Idealism is fine, but the facts suggest that despite the report, whether the U.S. administration approves the XL pipeline application or not, the resource will be exploited and produced. It’s up to you to decide whether you want to control how the bitumen is processed and the emissions abated or not. Processing the bitumen in the U.S. guarantees a measure of control over the emissions via EPA rules and regulations. Processing the bitumen in China means there is no control whatsoever. Canada is not going to leave the resource in the ground for all time, you can be assured of that. So, it’s up to you to decide — process it in the U.S. or process it in China — your’s to choose. Only when the last tree has been cut down, the last fish has been caught, and the last stream poisoned will we realize we can not eat money!! The comment submitted by D.J. Roach is extremely dangerous thinking because it makes the assumption that the tar sands oil will be exploited irregardless of the dire consequences to the plantet Earth’s climate and to the life on the ONLY PLANET IN THE UNIVERSE KNOWN TO SUPPORT LIFE (AT LEAST NOW) AS WE KNOW IT!!! False assumptions can lead to false conclusions. We are not talking about suicide of human life but committing suicide for all life as we know it. So if we follow the information that the majority of climatologist and it turns out to be untrue what is the fault of that? The oil barons loose their billions of $$$ the jobs associated with the exploitation of the oil are lost. But what if they are right?? The very large “carrot that is being dangled” with the jobs can be replaced by the creation by a whole new industry associated with the harnessing of sustainable energy sources. What if it turns out that we absolutely cannot SURVIVE without exploiting those extremely “dirty” oil sources then it will still be there as it has been for hundreds of millions of years. What should those mortal beings, the only ones in the Universe presently known, that supposedly posess the power of reason do? Will the power of greed reign over the power of reason? And what will the probable consequences be?! Mr. Roach seems to believe that American corporations are actually controlled by regulation. Where has he spent the last twenty years? Reagan talked a “good” game, but didn’t actually change much. “Our” Bill Clinton and VP Climate Change Gore were responsible for a lot of reinventing government to deregulate the economy. Now the economic boom has busted and we are only starting to pay the price for weakening environmental protection. Do I trust “American” corporations (whatever that means in an era of globalization) more than Canadian or Chinese? NO. I wish I could trust Pres. Obama. It’s hard not to like him, but he is, at best, a moderate Republican, and as such a creature of big oil. He likes to show his independence from those of us who voted for him, esp. teachers and now environmentalists (who overlap considerably since the former are responsible for teaching the facts of life about the world to our children). John Kerry showed even more courage than he demonstrated as a soldier when he asked Congress how do you ask a soldier to be the last man to die in Vietnam? We need him, and Pres. Obama, to have the courage to keep our most precious resource–clean water–safe from oil. We can walk, bicycle, take public transit, but we can’t drink the oil. Or if we can delay the development of these tarsands long enough, perhaps the world will have time to wake up. And perhaps more energy efficient and electric cars will develop to the extent that the world realizes that we can do without this noxious fuel. And perhaps with more time Canadians would organize to oppose continued development of this stuff. Stop Keystone from starting, We Don’t Need it. We Don’t Want it. Nor do our children’s, children’s children! I higly respect President Obama and so hope and wish he makes the right decision now. Frankly, there can only be one decision. We, our children and grandchildren, many generations to come NEED air, clean water, an ecosystem in balance, that now can’t talk to defend itself. We will be sick, paralysed, hungry, thirsty and in desperate need of medication, that can’t be manufactured anymore, because the necessary ingredients are gone. Don’t be fooled by speeches of cleaning toxic air and fixing the polluted fresh water. It will be too late. Hard decisions have to be made, and you have to cut a gangreen leg to save a life. Many lives now and in the future. Let the Obama administration be one that we can look back on as the guardian of the planet. So that other administrations can follow in his footsteps, knowing he did the decent and honorable thing. seriously set back our plans for a clean energy future and give us no economic benefits in return. I think not. The President should just say NO! to the Keystone XL pipeline. – The 181 million metric tons of (CO2e) from Keystone XL is equivalent to the tailpipe emissions from more than 37.7 million cars. This is more cars than are currently registered on the entire West Coast (California, Washington, and Oregon), plus Florida, Michigan, and New York – combined. – Between 2015 and 2050, the pipeline alone would result in emissions of 6.34 billion metric tons of CO2e. This amount is greater than the 2011 total annual carbon dioxide emissions of the United States. – The International Energy Agency has said that two-thirds of known fossil fuel reserves must remain undeveloped if we are to avoid a 2 degree C temperature rise. Constructing the Keystone XL pipeline and developing the tar sands make that goal far more difficult, if not impossible, to reach. Any objective analysis of the impact of building Keystone shows that it would be a climate catastrophe. Instead, the State Department seems ready to buy into the pipeline propaganda of an army of lobbyists who are trading on their ties to Secretary Kerry and President Obama to taint the decision. The president must act in the national interest, not the interests of Big Oil, and reject the Keystone XL pipeline. If he’s to keep his promise to confront climate change to protect America’s wildlife and communities, President Obama should say no to the proposed Keystone XL tar sands pipeline. Our leaders can’t have it both ways – if they’re truly committed to protecting America’s wildlife and communities from climate change, they need to say no to Keystone XL and massive amounts of climate-disrupting carbon pollution it would deliver. USE COMMON SENSE! HALT THIS CATASTROPHE! The people of this country and their representatives have the power to prevent the Keystone Pipeline that will carry Tar Sands Oil to the world…now. We can’t choose for Canada or China or The Oil Barrons. But we can buy time, run interference for a while. At least, we can slow the process. At best, we can revise practice that began global warming and reverse it. If Obama does not stop climate abuse now, and from now on, he betrays us, the world, and all known life. Do you have a link to the 181 million metric tons stat? The link in the report is bunk. This report shows the potential negative economic costs of the pipeline to society. The oil companies take profits and pay for none of the costs of the pollution they create. In short, they pollute their way to prosperity for free. Based on this and all of the negative environmental, cultural, moral dangers associated with the pipeline in particular and global warming in general that are detailed in other publications, the pipeline should be stopped immediately in this country. Also, the Canadian government should abandon its plans to sell this dirty oil on the world market. Continuing to market the dirty tar sands oil places profits way ahead of humanity and way ahead of what is good for the planet. We need an international plan to gradually phase out our use of fossil fuels and step up our efforts to use non-fossil fuel sources of energy — wind, solar, water, geothermal. Those sources must be our answer in the future. Germany has made great progress in using alternative forms of energy. We should model what they are doing. I hope and pray that the evidence and opinions presented in these one million comments against the pipeline in particular and against global warming in general will cause the president to choose people over profits in making this decision. He is an extremely bright man with a most competent and knowledgeable staff. This is a political and moral decision. Does he realize how little time we have left before the dangers of global warming cannot be reversed by the activity of man? Please, Mr. President, do not let this dangerous situation reach the point of no return. This, more than other decision you make, will determine your legacy! Time will tell if you made the right call on this major issue. I think we have to stop hoping for Obama to change. If you looked at his record as a senator, you would not have had such high hopes for him as President. Unfortunately, the corporate powers will not let an honest candidate enter the White House. It’s up to us to make the changes at the grass roots level. There are incentives to go with solar etc. but they are not enough to make the systems affordable for most people. We need to push at the local level for more incentives. Like, computers, the more we buy them the lower the cost. As responsible citizens and hard working tapayers, it is our civic and moral duty to continue in the fight against global warming. It will require sacrifice and giving up of conveniences—walking, bicycling, using public transportation, riding a scooter, all which take up more time to get to and from work. If you have small children these alternatives would be extremely difficult, since pre-school age children need a means to get to and from daycare. Carpool with a trusted neighbor who owns a multi-passenger van. Look around and do some research online for for hybrid or electric multi-passenger vehicles as a family investment. Giving up that dream vacation by car, plane, boat, or train would mean not leaving behind a big carbon footprint. There are plenty of local parks, recreation centers, musuems, and festivals, some within walking distance. Take the time to sign petitions and forward them on Facebook, LinkedIn, or Twitter. Even make the sacrifice of taking an afternoon of time off from a job to join a rally. If you are a teacher or a community service worker, enlist young students to get involved as well as senoir citizens, for the sake of their children and grandchildren. The Keystone XL pipeline will be built if we depend on government to petition for us. They are going to give in tothe mega-billion dollar corporate lobbyists no matter what, not to the hard-working individual American taxpayers. As being one of the children of the next generation to try and improve this world we are living it . I am thinking that looking at the way the world is with all the global warming problems. We have to try and keep the pollution of carbon dioxide as low as possible. Even though the world uses oil for millions of different products. We have to keep in mind that the world is dying and by launching this project will increase the way the pollution is destroying the earth. and i believe that the leaders of the world should act in the best interests of the earth and the people. I refuse with launching this project because of the vast amounts of pollution that is going to be giving off. Why would this project even be considered?? Climate change alarmist state that Global Warming is fact. Global warming deniers say it’s a Hoax. Both are right. Global Warming Alarmist state there is definitive proof of man made Global Warming based upon reliable temperature data records in the last 160 years or as they like to sight, climate change began when at the time of the industrial revolution. Historical facts shows there were two major convergent events that happened in the 1850’s that Global Warming Alarmist will not address as it relates to climate change they say started 160 years ago. The Alarmist want you believe that the climate crisis today was due to the birth of the industrial revolution in the 1850’s with the use of fossil fuels since with the release of CO2 into the atmosphere. The second major event that occured in the 1850’s that the Alarmist must omit was, what were the climatic conditions in the world in the 1850’s? In the 1850’s was the end of The Little Ice Age. The Little Ice Age had significant negative effects on much of the population around the globe in the mid and high latitudes for most of the previous 450 years. The Alarmist will not address the state of the climate in 1850’s because it does not fit their narrative that man’s use of fossil fuels was the beginning of the global warming crisis. The Little Ice Age is a well documented global event between 1300’s to 1850’s that the Alarmist must ignore it. So why does the “Little Ice Age” matter? The Little Ice Age began in the late 1300’s and was preceded by a long period of favorable warm climate conditions in Europe and most mid latitudes around the globe called the Medieval Warm Period with temperatures 2 to 4 C degrees higher temperatures than they are today. The Little Ice Age began with a sudden decline in temperature and significant change in moisture patterns over most of high and mid-latitude land mass’s but was very well documented in Europe where temperature decline was between 4 to 7 C degrees with resulting catastrophic results for the population of Europe with proof of over 17 different famines and approximately 25,000,000 untimely deaths during this 450 year period. Two other methods the Global Warming Alarmist use to show as proof to validate their hypothesis of man made Global Warming is the verbose use of that science and use of super computers to model climate and the negative effects of CO2 is a pillar that Global Warming is fact. However there are over 54 different super computer models showing climatic prediction ranging between .5 degree change to 18 C degrees increases in temperature by the end of this century? So which is right, they all cannot be correct? Computer models are just that models, they are only as good as the data and variables imput into those models. In other words insufficient data errors can and do create dubious data out, as noted by the 54 models sited above, all cannot be correct. The Earth’s climate has millions if not billions of variables that make up the climate with many of these models far beyond just increased miniut increases in atmospheric CO2 build up prove absolutly nothing in a model such as Earth climate. Another pillar Alarmist use the scientific consensuses argument . Alarmist site that 98% of climate scientist believe in climate change. However the spin stops there when the facts get in the way of the reality when a second a question is posed to this same Climate Scientist? Has the Earth warmed since the 1850’s because of increased CO2 release due to fossil fuels use by man, the actual number of scientist who agree plummet well into the LOW 30%. Bottom-line the REAL science climate of CO2 increases causing climate change is far from settled as the Alarmist would have you believe.